Kickback with the crew in your spacious living area. Cushy couches and a cozy fireplace make for a perfect hangout. Plush bedding and crisp sheets are calling your name. Only custom pillow-top mattresses here. Snapworthy scenery and several fire pits make the patio prime real estate. Sit back and unwind after a powder day. Exercise enthusiasts will appreciate the sleek fitness center, plus onsite classes like Spin, Yoga and Pilates. You deserve a little pampering. Check out the award-winning Spa Anjali and its mountain-themed treatments. Catch a ride on the Riverfront Express Gondola 7, steps away from the resort. Treat yourself with a visit to Spa Anjali for a Red Clover and Mountain Honey Body Mask or Moor Mud Wrap. Get your snacks ready and challenge your family to a hike. Booth Falls Trailhead is an 18 minute drive from the resort. Brag about your score at Country Club of the Rockies, just a 6 minute drive from the resort. The Westin Riverfront Resort & Spa has everything you need for a family ski adventure or a relaxing spa getaway (though we recommend doing a bit of both). Want the convenience of a ski-out lodge away from the hustle and bustle of the ski village? Then you’ve hit the jackpot with the Westin Riverfront. 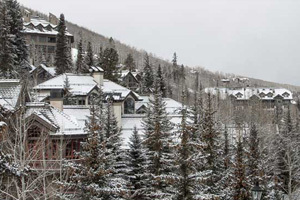 The resort’s in-house rental shop, Beaver Creek Sports, has everything you need to get the most out of your trip – from ski and board rentals to overnight tune-ups and waxing for personal gear. Once your crew is fitted for a day on the slopes, hop on the Riverfront Express Gondola – it’s right outside the lobby! Ride right up the mountain, or hop off at Beaver Creek Village to explore other trails. One of the tykes not too keen on skiing? They’ll love the Westin Family Kids’ Club. Every day features fun and educational supervised activities. Your little one can learn about pioneers and play with other kiddos while Mom and Dad ski the day away on the mountain (or get a couples massage at the spa). No wonder this place was named one of the Top 10 Family Resorts by Holidays with Kids. The notoriously pet-friendly resort even pampers your canine companions (big and small!) with a cushy dog bed and treats upon arrival. If you feel like being pampered yourself, set aside an afternoon to spend at the Spa Anjali – one of the Top 25 Resort Spas according to Condé Nast Traveler. Choose from a menu of unique alpine-inspired treatments (faves include the Moor Mud Wrap and Matterhorn Foot Massage) or get a mani/pedi at the full service salon. At the end of the day rendezvous with your crew in the suite and see who’s down for a soak (everyone). Swap ski jackets for swimsuits and head down to one of the outdoor infinity hot tubs overlooking Eagle River. Every suite at the Westin Riverfront is spacious, modern and bright. Tastefully decorated with a blend of natural materials, serene colors and contemporary style, the suites feel upscale yet homey. Even the studio unit has a hardwood-floored foyer and designated sitting area with fireplace – plus a kitchenette. One- and two-bedroom suites include fully equipped kitchens with stainless steel appliances and a dining area fit for dinner parties. Expansive windows look out on Avon’s alpine beauty (request a higher floor for the raddest mountain views) and are perfect for letting in that fresh mountain air. Every room features signature Heavenly brand mattresses for blissful sleep each night. They even have Heavenly dog beds for your furry friends! All the shops and eateries of ski village are just minutes away by car or gondola, but dining abounds onsite. There’s a small market and full-service Starbucks in the lobby for grab n’ go snacks and caffeine fixes. Parlor 126 is a prime après hangout, with classic pub fare and live music. Meanwhile the date-night-worthy Maya Modern Mexican Kitchen & Tequileria boasts a gourmet menu and patio seating – don’t worry the fire pits (and a tequila blancos flight) will keep you toasty.